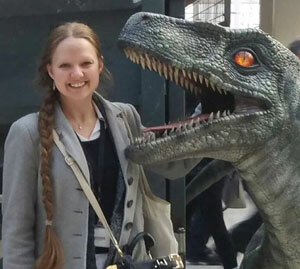 I am the acting GCG Rep and regular Blog Editor for NatSCA which means I seek out, edit and format regular content from both internal and external sources, as well as writing regular contributions myself. I thoroughly enjoy working for NatSCA because I believe that Subject Specialist Networks are a speedy way of sharing knowledge, and giving and receiving support within the sector, making them an integral resource for volunteers and professionals alike. At the Horniman Museum I look after the palaeontology, mineral, and osteology collections. My day to day job can be anything from collections management and answering enquiries, to facilitating family activities, giving talks, and promoting the collections through social media. My largest project at the Museum is curating and researching the Bennett Collection; a 175,000 specimen strong collection of largely uncatalogued fossil specimens, currently unknown to the wider world. My specialist area is fossil sharks, in which I did both my Master’s degree and my PhD. My current focus is on the cohabitation of chondrichthyan trophic-groups, and analysing how they have changed over geological time.